Its my first time to go to HK. What's the best way to go to the following places? It will be our first time in Hong Kong. 2 days in HK - 1 Day in Macau -1 day Hong Kong. We have already booked at BP International for our 2 days in HK. The last day was not booked yet. Can you advise what is the best itinerary for us. For our last day in HK, what hotel and itinerary can you advise? Also, can you tell us how to go there from our hotel. Is it advisable to buy an octopus card? Thank you in advance for your help. This site is very helpful. I will recommend this to my friends. Please read thoroughly the instruction above and click the link provided for additional info. I think all the info you wanted is already written above. Let me know if you've specific direction you wanted to know. We are arriving HK on 2 May 2013 at 1045H and departing for Manila a on 5 May 2013 st 2025H. B P International Hotel Hong Kong is a 4-star hotel located at the heart of TST at 8 Austin Road, Kowloon, Hong Kong. About 5 minutes walk to the Austin MTR station Exit F and 6 minutes to the Jordan MTR station Exit C2. Please read this topic "what transportation to take in going to BP International hotel from HKIA and how much?" to know how to travel between HK airport and B P International Hotel Hong Kong also, you can see the hotel location map and its nearby MTR exit access points. Get into the Jordan MTR subway station. Take the Tsuen Wan Line trains going to Central station and get off at Admiralty station and then take Exit B (6 minutes @ HK$8.1). Right upon exit, you'll find the Admiralty (west) Bus Terminus. Take the CityBus CTB 629 that will bring you straight to Ocean Park main entrance (about 25 minutes bus ride @ HK$10.6). Get into the Jordan MTR subway station. Take the Tsuen Wan Line trains going to Central station and get off to that station (8 minutes @HK$8.1) and then take Exit J2. Walk about 12 minutes to the Peak Tram terminal and then take the Peak Tram up to the Peak (7 minutes @ HK$40 for round trip ticket). Or, if you're coming from Ocean Park and go to the Peak, get back to Admiralty and then take a short taxi ride to the Peak Tram terminal, less than 10 minutes @ HK$20. Get into the Austin MTR station. Take the West Rail Line train heading to Tuen Mun station and get off at Nam Cheong station. Interchange trains to the Tung Chung Line heading to Tung Chung and get off at Sunny Bay station. 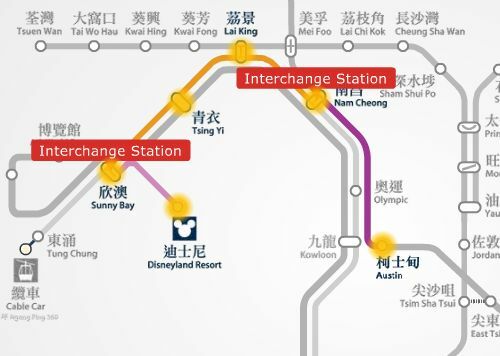 Finally, interchange train to the Disneyland Resort Line to bring you straight to Disneyland station (29 minutes @ HK$17).